The PUPA Vamp! Mascara and Multiplay Makeup Set combines a lash-enhancing mascara with a sultry eyeliner to lend your peepers striking definition. 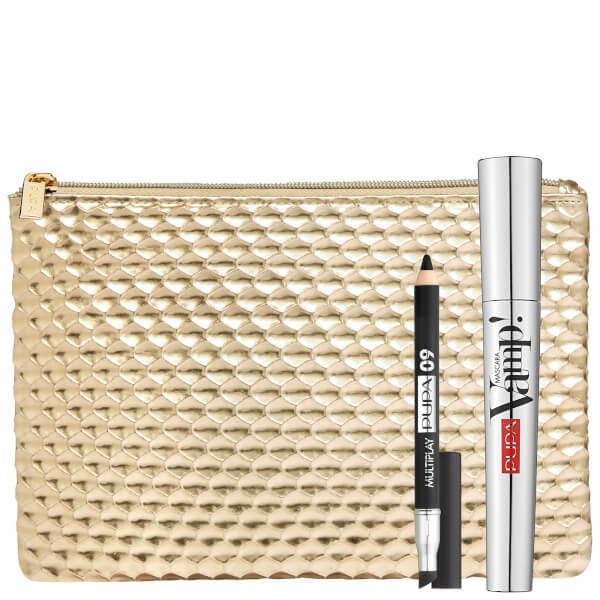 Complete with a textured gold clutch bag. A thickening, high-performance mascara that delivers high definition lashes. Enriched with an array of waxes, the smudge-proof mascara boasts a creamy formula that coats each individual lash, whilst a special filming agent offers strong yet flexible hold. The built-in applicator is designed in an intelligent sinuous shape with soft and dense fibres. This allows for the ideal dose of mascara to create exaggerated and volumised lashes. The round tip allows you to target the shortest and most difficult to reach eyelashes, ensuring each hair is coated for the fullest results. Paraben Free. A long-lasting eyeliner that lines and defines your peepers. The kajal pencil effortlessly glides onto the eye, delivering ultra-intense colour payoff with a blendable finish. The double-sided pencil can be sharpened for precise and defined results, or smudged using the built-in smudging brush. This can create an array of looks from smokey eyes to using the pencil as eyeshadow. Suitable for sensitive eyes and contact lens wearers. Free from parabens. Ophthalmologist tested. Mascara: Start from the base of your lashes and comb them with zigzag movements up to the tips. Thanks to the immediate product release and to its rich and creamy formula Vamp! immediately gives an oversized volume to your lashes! To enhance them to their maximum, we suggest to apply mascara over and over again, going from one eye to the other, until you get the volume you are looking for. For that final touch, use the tip of the applicator vertically. Eye Pencil: Starting from the inner corner of the upper eyelid, follow the natural lash line, stopping according to the natural shape of the eye and to the desired result. Smudge the line if you wish to get a shaded effect. Then repeat the operation on the lower lash line, blending with an eye brush or a smudger. The shaded effect works as a base for our eyeshadow as it helps increase its hold and guarantees a homogeneous application. This product can be also applied on the lower waterline to give greater depth to your eyes.